Hello and welcome to every single food blog at this time of year. It was bound to happen eventually, dear reader, at some point I was going to have squash puree leftover and it was going to be made into a frothy concoction. Now my favourite pumpkin is of course: Generic Orange Squash Flesh. Seriously, the difference between a random butternut and a pumpkin isn’t that great unless it an extremely sweet pumpkin and even if it is just use more sweetener. No shops sell pumpkin puree here, but they do sell squash, often cheap, and once you add it all together it doesn’t really stand out that much. I’m running the recipe down a bit, aren’t I? No harm intended. It’s a pretty decent way to use up some squash. I like the fact that the squash gives it a real rich, thickness. I only have an ordinary blender so it was slightly gritty. Though it did froth up really well. I tweaked this a bit with the milk, if I added cold milk to hot coffee I’d have lukewarm at best. I didn’t want to dump it all in a saucepan, I’m still tired and that’d mean more cleaning up. Microwave to the rescue. So, this is my first Pumpkin Spice Latte, I could mock the ubiquity of pumpkin spice products, but I won’t. People like what they like. It’s nice in that there’s nothing messy going into it, I can imagine that commercial ones would feature more than the basic ingredients. So, a nice hot drink, warming spices and a handy way to use up puree that’s left over from making bread. I’m one month post-surgery this Thursday. I’m standing almost completely straight, there’s still swelling, nothing severe thankfully, and numbness, but it’s doing well. It’ll be a long road, but this is the last major hurdle. There’s no pain, dear reader, not like there was. No pull, no muscle strain, no self-hatred. I’m getting sleepy even writing this, I get bursts of tiredness, but that’s to be expected. Your old pal Jack is doing just fine, so have no fear. I forget if I mentioned it, but the Crab Apple jelly has new photos. I made a rosemary version and it was amazing with turkey. I’ve heard it’s great over ice-cream too. If you’re looking for more pumpkin spice recipes remember I’ve used it a lot and there’s a tag devoted to it. See you later, dear reader. 1. Heat the Milk in a microwave or saucepan until warm. 2. 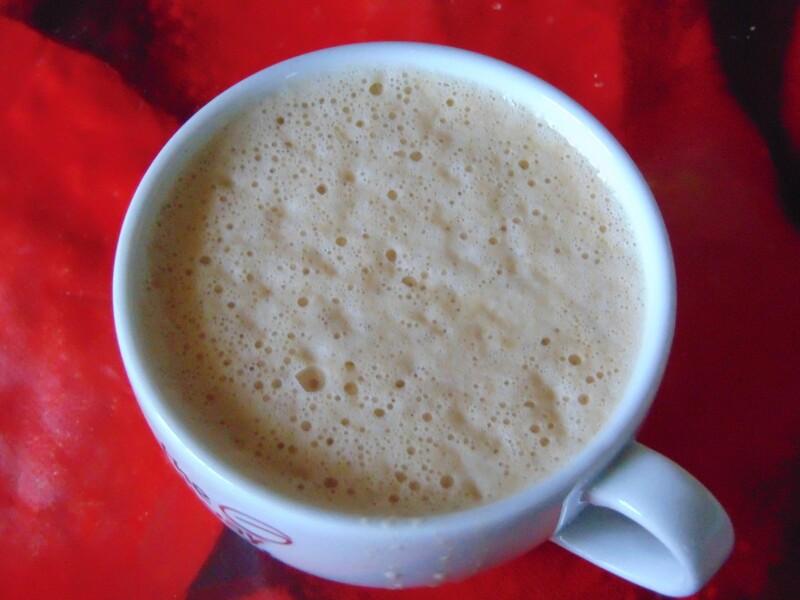 Add the Hot Coffee, Puree, Maple Syrup, Pumpkin Spice and Milk to a Blender and process until frothy. This might be a bit muddled as I’m still not feeling all that well. This recipe is basically this one redone. I’m just using up my banana flour, it’s edible. Fast too. It’s a springy, slightly dry loaf that is pretty much my last resort when using new flours. I know I shouldn’t run down a recipe, but it’s mine, I can do that and I wouldn’t sell you on a recipe that wasn’t worth much. You can eat it and you won’t die, that’s about it. I’m being a bad blogger, but forgive me for I know exactly what I do, but I have the recipes. Bribery? Tut. I like to think of it as blackmail. Okay, yeah, rant below, recipe below that. Below all that is me passed out. Until later. I just popped it out of the tin and cut it. Don’t do that. Not that it matters. This isn’t a clever, intricate recipe. If anything it’s the most basic kind of free-from recipe, it’s comprised of ingredients that can be interchanged without altering the end result, which might sound impressive until you realise the end result is just, well, being edible. So it means that the ingredients aren’t being used to their utmost. It’s a matter of utilitarian baking, use what you have and end up with the same end product. It’s similar to recipes you see from companies trying to push their product. They’ll use one ingredient, whether a combination, or another ingredient would be better, to the detriment of the recipe just to sell you on the product. That’s their choice, but you see then we have the assumption that nothing better can be made, I mean, if you’re new and your first exposure to free-from baking is company’s recipes, and will likely be, then that means you’re starting from an erroneous position and will need to learn from scratch to get better. I’m not being arrogant here, it’s not that I’m some kind of expert, perish forbid, but I know what I’m doing and I started the same way. It’s just now I can look at these recipes and go: Oh, yeah, no that’s just not good enough. Serviceable is fine, but that shouldn’t be where we stay. You can eat better, much better, with the same amount of work, you just need a better understanding of the ingredients and anyone selling you on a product or service might not be able or willing to help with that. I’m dizzy, I’ll hope this isn’t taken as offensive. Just my point of view. If someone like me can do as I’ve done and continue to do then you can do it too, dearest reader. 1. Preheat oven to 175c (Fan). Grease and line the bottom of a baking tin. 2. Mix together all the dry ingredients and set aside. 3. Add all the wet ingredients to a bowl and beat together, using an electric mixer, until smooth. Then add the dry and beat until mixed completely. Scoop into the prepared tin and bake for 20-25 minutes, turning halfway if necessary, or until a knife comes out clean. Loaf should be golden brown and firm. 4. Let cool in the tin for 15 minutes then transfer to a wire rack to cool completely. The tray was packed to the edges when I started. I think the chronology of this post might be slightly out of joint, but that’s just part of the thrill ride that is Pep’s Free From Kitchen, right, dearest of the dear reader? As you can see I’ve been a-roasting pumpkins again. When I roast it I want to remove as much moisture as possible so when I use it in doughs and the like I can control the moisture better. This was another cooking pumpkin, sadly they never give the name of the variety. No Hokkaido pumpkins this year either. These are trying times. So today I’ll be talking about pumpkin recipes I’ve tried, er, today. But first I just want to bother you with a book, or rather a trio of book recommendations. I won’t spoil them, I won’t even read summaries if I don’t have to. I like going in completely blind. If you like fiction mysteries set in the modern era then you have to, no if and buts, literate reader, read, in any order: The First Fifteen Lives of Harry August, Touch and The Sudden Appearance of Hope, all by Claire North. I really enjoyed them. Now I’m starting a book by the author of Hanako’s Route in Katawa Shoujo called The Zemlya Conspiracy. I think it’s a dystopian tale, but it’s Hanako’s author! That’s all I need. That probably doesn’t mean much to you, but I’m sure you’re happy for my hype. You’re a good egg like that. Food blog? Always sometimes often. Now, I am not a food blogger. Wait, no, I am, but not in the usual way. I don’t ever seem to fit a mould like others do, in anything really. I’m not disparaging them, if anything I’m praising them. Wonderful photos, concise and clear purposeful posts, contests, social media engagement and I’m just sitting here telling you how I stuck roasted pumpkin into everything. I’m me, Jack in the Garden, me in the kitchen. I try whatever I can, push ingredients to their utmost potential, they’ll never look as fancy as others could make them, but they’ll taste great and I’ll push them further than is sensible. I assume you support this blog, outside of a sense of masochism that is, to see me, just me, doing what I do best. Testing the limits of limited ingredients. So to start we have Roasted Pumpkin Spice Tortillas or wraps. It’s a tweak of my buckwheat tortillas and is already on that page, just roll to the bottom. You’re all really great people. I’m addressing you in a lump, but it’s a sincere lumping, a heartfelt lump. I forgot to take a cooked photo! My head isn’t droopy, concerned reader, I have no neck issues, it’s hanging low with shame. I…well you see, I ate it before I took a photo! It was so good as a flatbread or tortilla. It tasted so good, chewy and that kick of spice was wonderfully warming. It also makes crackers if you’re so inclined. As to the why….why not? I like putting pumpkin spice into recipes that no one else is doing. As ubiquitous as it is its savoury applications are lacking in some regards. So I’ll stick a big foot into the fray and give you an absurd assortment of uses for it. This was just the beginning, all done today too. I also wandered out into the garden and dug up weeds, removed placed and pinned a roll of weed control matting. It looks so tidy. As I was digging, Naru, the Labrador, decided that she was going to help and plopped herself down on top of the weeds and I had to rake around her. she didn’t seem perturbed. That dog is my best friend. She’s a character. She loves wandering about smelling the flowers. This run of matting is for the planned squash boulevard, a straight line of ten squash pots. I still have a lot to do yet, but it’s enjoyable to do a bit here and there and see it starting to come to fruition. Roast Pumpkin Soba. All found here. Ah, soba, that ephemeral pasta that dries out within minutes. Perfectly flexible and then a short while later a cracked mess. The perfect soba needs to be cut and plunged into boiling water. Don’t bother trying to be clever, dear reader, I’ve tried. It works best made fresh. As you can see if you’re looking at the recipe page I’ve taken many a liberty with soba. I’m sure Japan will forgive me, mostly due to the fact my readership is very rarely found there. This actually turned out really well. You could really taste the pumpkin and the dough wasn’t that hard to get thin, not chia thin, but close enough to make some slippery strands of noodles. You know the problem with me and food? I’ll try everything at once. I made wraps, noodles and a sauce, more of a dip I guess, more on that in a minute, and ate it all in one go. These would be better separate, I know that now, but it was fine try it all at once for me, probably not true for anyone else. I’ve learned to turn off my taste-buds, to blank it out and just shovel in food when necessary. Again, not a great food blogger, I’m just an experimenter. You have to admit that roasted pumpkin soba is kind of interesting, right? Whoops. Need to type this up. Tahini Sauce found here. Cold noodles, warm chicken and what was really more of a dip. See, what did I say? Take it separately if you want to try it. Maybe make the wraps into crackers for the dip. What dip? Oh, yeah, I forgot. It’s Roasted Pumpkin, which I have to keep copying the same instructions for as it needs to be so very dry, though for the dip there’s more leeway, wait for it…PUMPKIN SPICE Tahini dip. Even white girls are looking at me in askance. I’m being humorous, you know, white girls addiction to pumpkin….spice…don’t leave me, dear reader! Ahem. I’ve pushed the envelope and it’s fallen off the table. But, you know what?…*Leans in*…It was good. Chunky, hence the dip designation, but you could taste each element, the sweetness of the pumpkin and the maple syrup, the harsh note of the tahini and salt, the garlic and spices warmth. On the end of a Roasted Pumpkin Cracker it’d be great. Sorry to make you go to the individual pages, but there are numerous variations on each and it’d be a shame not to plug them too. Food is food, the rules are there to be messed with. Hand me seemingly countless limits and I’ll hand you back recipes with interest. Now, if you’ll need me I’ll be in the garden, with Naru. We have work to do, her and I. Until later. Start at the end and confuse everything. Ah, Dank Rebar, no that’s not right. Disabused Ramparts? Er, Dishabille Rancour? Oh, wait, Dear Reader, that’s the one. It’s me again, well, it’s always me isn’t it? If it ever isn’t then you have my permission to worry. So, why am I back again? Well, cheap squash and unpredictable weather patterns. I’ll start with the squash this time around. The bread is Hokkaido Pumpkin Cinnamon Bread minus the pumpkin because there’s nary a pumpkin to behold, don’t hold them too tightly, they frown on that in supermarkets, around here, but butternut was thirty two cents a piece. 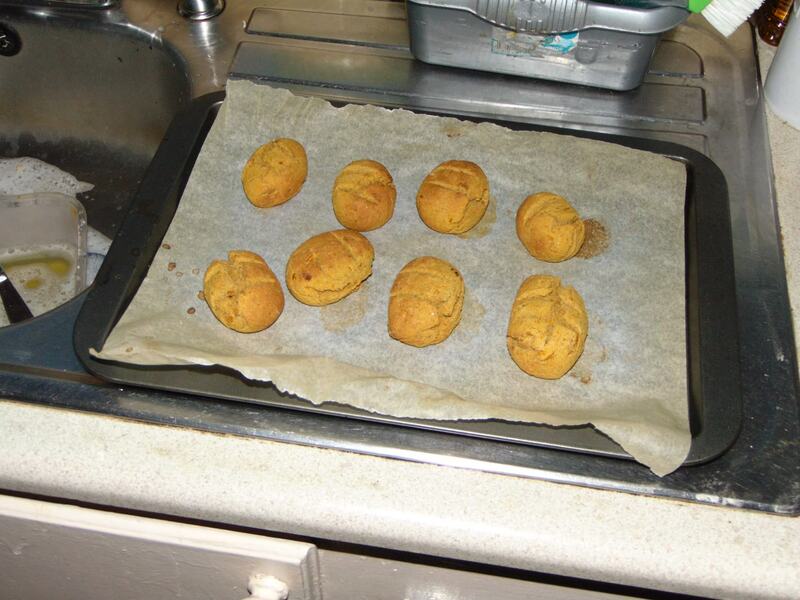 So I made a butternut squash version of my Peanut Butter Cookies, no egg needed. This is vegan, gotta look after my vegan pals. Now everyone and their dog has this recipe in some form or other, but do they have seven variations!? Probably, still, it’s nice to have a quick cookie recipe with so many different options. It’s an under-loved recipe. Dear to me, Dear Reader, but not to many others sadly. Go there for the new version. And, yes, you guessed it: Pumpkin Spice! They’re chewy and crunchy, a great combo. My version doesn’t use as much sugar as some as I once made myself very ill with a heavy sugar-laden version. You’ll need the electric mixer, they go to crumbs rather than a ball. I’m being a real jerk sending you to the page, but it’s worth it. I never know how much information is too much in these posts. People are kind and it’d probably take more than a chain of garden posts to send them into a tizzy. The weather has been so weird. The sun was shining again today so I got to work again in the garden. I keep making work for myself, or finding it at least. I installed an over flow pipe in my barrels and sealed it in place, in other words: Shoved a sawed off hose into a hole I drilled and rubbed silicone on it. Walking around in the rain isn’t so bad, but doing that with a power-tool in hand isn’t such a great idea. Hence the numerous drill-based jobs. I lined up my planters using a very special technique: I used a spirit-level and a long bit of metal. So simple, but I never thought to do it. All the work on the greenhouse has taught me a trick or two. Can I be odd, odder rather, for a moment, patient reader? I often-times think of the mes that were, the fat-me etc, usually I think of them as dead and buried. These days I like to think they’re still here inside me, no longer a miserable reminder of hat I was, the struggles they faced are still here, but I feel them cheering me on, spectral spectators standing on the sidelines watching all this unfold, infused with colour, pale but striving towards iridescence. You don’t get away from past troubles that easily, sadly. Still if pain was going to do me in, it’ll take a lot more. I’m a tough nut, so have no fears, Jack will stay here. I do have be be careful in cold weather as my hands start to ache. I’m being smart, gloves aplenty here. I’m excited for next year, I’ll need a lot of flowers to fill all these planters. At least I’ll have the space to start them now, eh? Okay, I’ll see you soon. Two brackets for baskets on both sides and that should finish it. I’m letting that cure then I pin it down and put up a bracket to hold the guttering. I found it in the dirt, but it’s still good. These pots have a secret. They’re screwed down! No more mess when the wind hits. Or Naru. “Draining-board again?” I took away the sponge at least. Dearest Reader, it’s is, yet again, your pal, your forever friend, Jack. He of all trades, with a masters in none. That’s not the saying? You sure? I’m sure if they’ve immortalized me in a figure of speech I’d know it off by heart, by rote, etc. How could I ever be wrong? I’m glad you agree, that’s all for today them…the post? Oh, of course. This is just a bit of a meandering fill in post. I might be too busy to do much searching for new recipes, it depends on the weather, you know: Whether the weather can be weathered and the garden can become a bit closer to the vision in my head. So, today I learned that running putty is an old skill, not so useful in these blissfully insulated days of double glazing. So, yeah, I again end up older than I should be. On the flip side: The greenhouse is almost ready! The perspex is in, the putty has been put in place, the silicone needs a bit more. The door and skylight are in too. I was standing on a ladder, hitting the skylight into place by striking a two by four with a hammer. It’s an old frame, but solid. Nothing goes too easy in this household. Still, it’s turning a corner. Soon I’ll clean up the inside, pin the matting a bit more, sweep up the miscellaneous debris and set up the staging. I’ll have a greenhouse. That hasn’t fully sunken in yet. Two Barrel (I’ll get to the guttering too). Yeah, the barrels are tapped. They just need an overflow and I’ll start collecting a lot of rain water. I think I’ve done pretty well with my ideas, a lot of them have been successful. This garden should be transformed come next year. It’s worthwhile, you know? Nice to share too. Don’t worry I have a bit of a recipe for you today. As with the greenhouse and barrels some assembly is required. I’ve been messing around with the ever ubiquitous Pumpkin Spice (Follow the hyper-link trails, reader), I guess because I’m a Jack without a culinary country. A lot of Irish cooking and baking is cut off from me due to my issues with food. So I’ve wandered the world of various viands, multiple morsels, countless chow and, what feels like, every eatable. When I come across a staple of somewhere or someone I like to see what I can do with it. Pumpkin Spice is ultimately rather simple. It’s mostly cinnamon, but I do like its warming profile of spices. I was looking around the internet and spotted Pumpkin Spice Peanut Butter. So, I thought, why not try it? Butternut squash was going cheap, and what better to replace a squash, all pumpkins are squash after all, than another squash? I made Gingerbread with some of it, now Dairy Free, and the rest was saved for today. I steamed it in the microwave until soft and Sautéd it, it’s lazy, but works as well as boiling. Alongside the squash I sprinkled Pumpkin Spice (1 Tsp), Salt and Brown Sugar (1/2 Tsp of each). I’ve found pumpkin spice in baked goods is delicious but it’s apt to get lost in savoury recipes if not backed up with something else. Sweet and salty is always a good combination when using cinnamon, so here we are. The amaranth, no I’ll never tire of it, is a version of the Cashew Butter Amaranth, but with added garlic and Peanut Butter replacing the cashew butter. It’s, as always, too good, too pure, too delicious for this world. It elevates plain amaranth to a culinary zenith, the apogee of edibility, you know, it’s really tasty. The chicken is just plain with a bit of garlic. Pork makes my stomach hurt and beef is just boring without all the trimmings, fat-me knew, oh, lord how he knew, so chicken is good with me all the time. It all worked really well, squash and peanut butter is actually a really great combination, whether savoury or sweet and the slight kick of warmth from the pumpkin spice was really welcome. So, that’s that. I’ll be back with something new soon, I hope. You hope too and maybe it’ll come true. Later. Here I am again, the heart breaking heartthrob…What? I’m not the hazel-eyed idol of millions? That’s disheartening, I can only assume that you’ll continue to thrill at my proximity, I’m not with you, dear reader? Why, of course I am, I’ll always be right there, in you heart….or RIGHT BEHIND YOU! See, your heart is pounding now. Okay, you might have seen me mention amaranth is back in my kitchen. That’s right, that largely ignored, around here at least, seed, pseudo-grain is back to me after three long years. Now I’m not just going to rest on my laurels, I’m going full-force and figuring out new ways to eat it. Thankfully I’ve been here before when I first discovered it, a bit of curiosity netted me a wonderful way to use amaranth with nut and seed butters. As pictured above: Cashew Butter Amaranth. Creamy, lush and decadently delicious. But it’s all good for you. No need for butter or butter or even more butter. A bit of nut butter, shut up, I know, oil and salt and pepper and you’re golden. You can find all the tweaks on the recipe page. I had to figure all this out by myself. Amaranth seems to stay in porridge and never ventures forth. That isn’t my amaranth, the skies the limit when we get together. You know what I find troublesome? The elevation of these simple faring foods to some kind of superior status. Sure celebrating their nutritional worth, amaranth is the only seed with vitamin C or so I’m told, but when we push them as strange and exotic we scare people away. I can’t count the amount of times I’ve seen quinoa described as pretentious and thusly ignored. Sure it’s over-hyped in some regards, but it’s also a staple of my diet, has been for years. It’s a seed, I don’t think of it as anything else. If you want to extol the lofty benefits of amaranth, remember that it’s technically a weed. Not so intimidating now, huh? It’s a shame to see so much food ignored due to silly biases. Carob is a favourite of mine, but as it was once, still is really, positioned as a chocolate alternative now it’s hated by it’s failure to match that expectation and is regulated to dog biscuits, all too often (Not that that stops me). Heck there’s linseed oil, aka Flaxseed, in my greenhouse putty! I eat ground flaxseed daily. We just need to be a bit braver, more broad-minded and try, try, try. You never know when you won’t have quite so many choices. Sorry, I didn’t mean to be a blow-hard. Look skulls! The miraculously keen-eyed of you out there may have noticed the roasted tenderstem broccoli. Which is apparently a hybrid of broccoli and Chinese kale. It’s like crunchy broccoli, even after cooking. I wasn’t wild on it. I’ve never been a fan of that raw vegetable crunch. Still, I’ll try any food once, if I can eat it in the first place that is. So, skulls, huh. I was looking up seeds and stumbled across Snapdragon seed pods, when they dry out they look like skulls. Which is really cool, yes, reader, I’m still immature enough to be tickled by something like this, never grow up too much, dearest reader. So I look up snapdragons, find they’re easy to grow and then find I have them in my garden already. Whoops. Jack is ashamed. Jack has started collecting seeds. I’ve never tried seed-saving before. I’m going to try flowers and some vegetables from the shop, less risk of inbreeding in the vegetables. I’ve got some painted sage, nasturtium and now snapdragons. I leave them in a brown=-paper bag and shake them. Then I sift the seeds and store them. I’ll just toss them in large pots and cover them next year. Nothing fancy, but I hope they’ll do well. I’m also looking into growing water-lilies in buckets. I also have a lot of landscaping to do in the garden yet. Poor Jack keeps getting beset by bad weather and other obligations, but, fear not, dispirited reader, I shall get there yet. Jack’s Garden shall be blooming beautiful! The final planter is positioned. The plastic is permanent (Weeds, so many weeds) and pinned down. Next year there’ll be pots a plenty. I wasn’t speaking of crops? Oh, er…CROPS! There we are. I had a little steamed Golden Nugget Squash left in my freezer, just enough to try out a tweak of my new Scone Recipe, all is found there, it’s also now possible to make them diary free. So pop to the page and scroll to the bottom to get the new tweak. I tried them with the squash, water for milk and with coconut sugar. All worked well. They were easier to bring together as the squash is drier than the apple, but the downside is that the end product was slightly crumbly. Though I could still cut it when hot as seen below. I did add something else that you’re no doubt sick of already: Pumpkin Spice. I’d make a joke about white women, but as the heart-throb…hhhmmm? You sure I’m not? I’ll settle for Baby-whisperer as I’ve now been titled. Babies love me. Dogs love me. Sadly neither of those groups frequent my blog. You aren’t a baby or a dog, are you, dear reader? No? Oh, that’s okay, I forgive you. So, yeah, pumpkin spice, it goes well with squash too. You could take most of the variations listed on my recipes, there are a lot of tweaks, and cherry pick them to suit yourselves. As I say this only changes the recipe slightly, but not enough to warrant a split. They were lovely fresh from the oven with butter. They baked a tad more dense, but not so much to be unappetizing. I’ll try more vegetables in future, some fruits too. Squash is a fruit, yes, this is confusing. As to the coconut sugar, see above, I just bought it because it tastes nice. You’ll have to do your own research. Until next time! Oh the crumbs! Oh the humanity! Okay, they’re not that bad for fresh out of the oven.